Derek Landy is the author of the bestselling, awardwinning Skulduggery books – the funniest dead detective ever! Before writing his children’s story about a sharply-dressed skeleton detective, Derek wrote the screenplays for a zombie movie and a murderous thriller in which everybody dies. As a black belt in Kenpo Karate he has taught countless children how to defend themselves, in the hopes of building his own private munchkin army. He firmly believes that they await his call to strike against his enemies (he doesn’t actually have any enemies, but he’s assuming they’ll show up, sooner or later). Derek lives on the outskirts of Dublin, and the reason he writes his own biography blurb is so that he can finally refer to himself in the third person without looking pompous or insane. 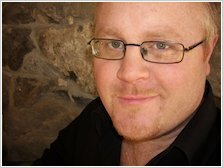 Derek Landy has won multiple awards for his Skulduggery Pleasant series, including the Richard & Judy and Red House awards. Who was the most memorable/inspirational teacher or librarian from your childhood? I had two inspirational teachers when I was growing up. When I was in Primary School(in Ireland, you attend Primary School when you’re between four and eleven/twelve) it was Seamus Tynan. That’s when I really learned to love books and reading, and I used to love to writing stories for class. Everyone else would groan when we got a story as homework, but I adored it. When I went to Secondary School (from the age of twelve to eighteen), my English teacher was Ian Steepe. As a teenager, my writing started to develop a little more, and he bolstered my confidence when I needed it, but also came down hard when I took the easy way out. He didn’t accept second best from me. In my book, I pay a tribute to both of these teachers by naming a character(who is a book publisher) Seamus Steepe. What were some of your childhood ambitions? Did you always want to be a writer, or did your writing career come as a surprise? I always wanted to be a writer. I wanted to be an artist too, and envisioned a life of writing and drawing comics. I loved comics when I was younger, and I still do. They’re a wonderful way to learn how to read, and they fire up the imagination. I don’t think there was ever a time in my life where I didn’t want to be a writer. I was always writing, no matter what was going on in my life, so I just always took it for granted that this would be my profession. I’m so incredibly lucky that I can do the thing that I love and make a living from it. What’s been your most memorable moment as an author thus far? My most memorable moment is still the moment when I first heard that HarperCollins wanted to publish my book. Earlier that morning I was wondering what I was going to do with my life. I was worrying about having no money. And then, when I was standing in a comic shop in Dublin, my agent called me and gave me a list of publishers who were interested in Skulduggery Pleasant. It was an amazing moment, and from that moment on, my life changed. I go to bed late, usually around three or four in the morning, so I wake up at about eleven. If I’m in the middle of a book I’ll usually start working at one or two, write solidly until five, and then break for a few hours. Most times, I’d get back to my desk by ten, and keep writing until I fall asleep. I love writing. I have so much fun that I really don’t want to stop, and when things are going well it puts such a smile on my face. When things aren’t going well I shrug, play with my dog, go out for a bit, and then get back to work, refreshed. Do you have a favorite place to write? I write at home, in my bedroom, while my dog sleeps on my bed behind me. A writer’s life is so solitary, and I’m quite unsociable by nature, so I need the regular interruptions of family to stop me from living in my own head too much. If it was up to me, I wouldn’t talk to anyone for days. Fill in the blank: I can’t write without _ . …happiness. If I’m in a bad mood, or if I’ve just had an argument with someone, I can’t write, because I just rerun the argument over and over in my head. I can’t have anything distract me. I once had an argument with a girlfriend, and I couldn’t write for weeks after that. The good thing about this is that I’m learning NOT to have arguments! It’s making me a lot happier, and I love being happy, and it sounds kind of strange but I really like smiling! I’ve learned to have fun with every second I’m awake. Do you have other jobs, or do you write full-time? What are some of the jobs you’ve held in the past? Can you identify any ways in which previous jobs have helped you become a better writer? I’m lucky enough to write full time, but before all this happened I used to work on the family farm. I cut cauliflowers and pulled leeks and packed lettuce for six years, and while I didn’t exactly enjoy the work, it actually helped my writing an awful lot. I found that when I was doing physical work, my mind would be able to carry on writing. I would not talk to anyone around me, any of my fellow workers, because I was writing the next scene or the next chapter, or I was plotting out the next story, in my head. Then, the moment work was finished, I’d hurry inside and spend hours translating it all onto the computer. Was there a particular inspiration behind the writing of Skulduggery Pleasant? For years, I wrote screenplays for movies. I had no intention of writing a book at all. I didn’t plan it, I didn’t sit down one day and decide to write a book, it just happened. Skulduggery Pleasant popped into my head and suddenly I was writing a book about a skeleton detective. I literally have no idea where the inspiration came from. It’s like he was there all along, at the back of my mind, and he was just waiting until I was ready to see him. Do you have a favorite character in your book? What did you enjoy about creating this character? Was he/she based on anyone you know? Skulduggery is a lot of fun to write, but I have a special affinity for Stephanie, who gets introduced to this hidden world and finds herself in way over her head. I taught Kenpo Karate for ten years, and while I was teaching the “kids”, I realised they were just as smart and just as witty as anyone my age. So, when I was writing the book, I saw absolutely no reason why my twelve-year-old character shouldn’t be as intelligent and as funny as my grown-up characters. Stephanie, therefore, is based on this attitude, and a certain few girls in particular who have never been afraid to stand up and question authority, a quality I’ve always admired.